Developing leadership at Stanstead College happens in all aspects of student life, from mentoring fellow students in the classroom to rallying one's teammates on the field. It happens in formal ways such as our prefect program and community service, and it happens through opportunities for students to travel and broaden their expectations. Stanstead College grows leaders. Prefects serve as liaisons between students and the faculty and administration and are expected to model appropriate behaviour and represent the school properly at all times. It is a great honour to be selected and an outstanding opportunity to develop responsibility and leadership skills. Stanstead College has participated in exchanges with schools in Germany, Australia, India, Kenya, South Africa and elsewhere. In addition, we provide placement opportunities here at Stanstead for gap students hoping to spend a year as a member of our junior faculty. For more information about gap and exchange possibilities, contact us. Students at Stanstead College come from, on average, 15 different countries, each with its own set of traditions, customs and history. Our international students have a chance to share their heritage during Multicultural Week, where they take over the school kitchen to prepare traditional meals from their home countries. Students who take part in our community service program once a week visit residents in nearby seniors’ homes, walk the dogs at an animal shelter and work with young children at local after-school programs. It’s a way to support the community and discover the two-way benefits of helping others. 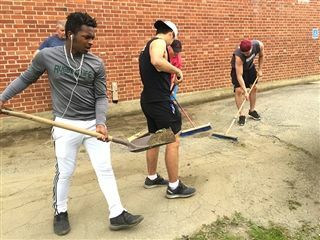 Plus, once a year, our students and teachers head out en masse to the Town of Stanstead and other areas to clean, pick up and help out during our Community Service Day. Stanstead College also partners with Olympia Schools in Vietnam as part of a service learning project located in a Vietnamese village, helping to improve the lives of local orphans and adults with special needs.